The diaphanous Wat Rong Khun (left) and sinsiter Baan Dum house (right) are both Thai modern architectural masterpieces. Chiang Rai, Thailand northernmost province, is home to two remarkable expressions of Thai contemporary art, each wild and bewildering in its own way. 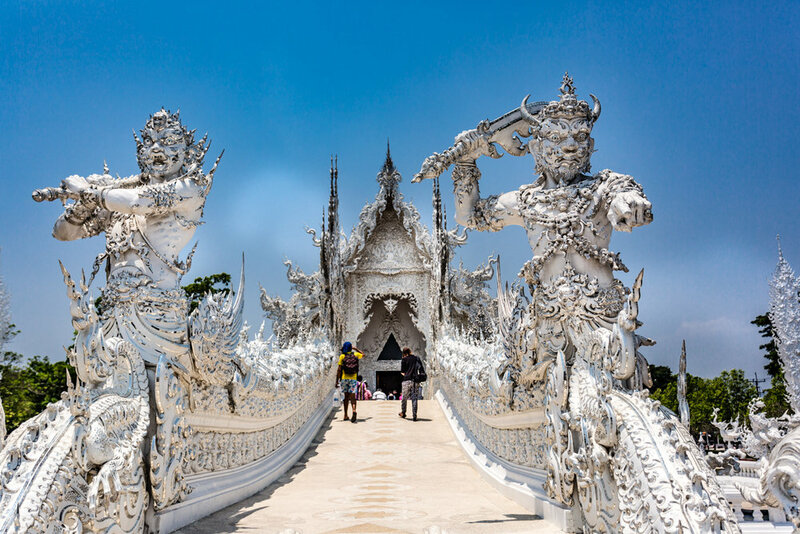 Lying just south of Chiang Rai Province’s eponymous capital city, is Wat Rong Khun. Often referred to as the “White Temple” by tourists, this shimmering temple complex is the brainchild of Thai painter-turned-architect, Chalermchai Kositpipat. The principal building of the complex is the ordination hall (called an ubusot), constructed as a white edifice with fragments of mirrored glass embedded into its exterior, said to represent the teachings of the Buddha. The intricate embellishments gives the impression that he building is covered under a layer of frost, imbuing the building with a quality of evanescence, as if the structure could melt out of existence at any moment. Perhaps Kositpipat designed Wat Rong Khun this way to engender the Buddhist doctrine of impertinence. Leadings to the ubosot is the Bridge of the Cycle of Rebirth, symbolizing the crossing over from the cycle of life and death into a state free of the suffering caused by human desires. At the far end of the bridge, guarding the “gate of heaven”, stand representations of Death and Rahu--an anthropomorphization of the planet responsible for fate, according to Vedic mythology. Like many Buddhist temples, Wat Rong Khun also features murals that contain religious meanings. However, the similarities with traditional Buddhist temples end there, as the angelic-white elegance of the exterior of the ubosot gives way to an interior bearing a visual inferno. The entrance wall is covered with wall art mixing Jakata symbolism with iconic imagery of modern western civilization, such as the burning Twin Towers, Neo, Spiderman, Pickachu, and Darth Vader, among others. These images are set against the backdrop of gigantic demonic-looking Chinese dragons. The wall on the opposite end of the hall, behind the sort of statue of a seated Buddha typically found in Buddhist temples, is a wall-sized mural depicting a peaceful Buddha bathed in orange hues. The symbolism of the murals are pronounced: The teachings of Buddha are an exit from the chaos and confusion spawned by the desires, ideologies, and cheap thrills, of the modern world. Death and Rahu guarding to the "gate of heaven" on the far side of the Bridge of the Cycle of Rebirth. The head of Hollywood actor, Jeff Goldblum, hanging from a tree. Unearthly depictions of Hollywood characters is a prevalent theme in Kositpipat's art at Wat Rong Khun. No visit to Wat Rong Khun would be complete without going into the golden building, probably the world's nicest bathrooms. The ceiling of one of the walkways leading from the parking lot to the visitors entrace, made of thousands of sharp-edged "lucky" tin leaves. If Wat Rong Khun is heaven then Baan Dum, also known as the “Black House,” is hell. This complex features the architectural and sculpture masterpieces of the late Thawan Duchanee, a contemporary Thai artist, who lived at Baan Dum for much of his life. The centerpiece of Baan Dum is an ominous stained-black, cavernous temple-like building designed in the Northern Thai “Lanna” architectural style. A world of macabre awaits inside it doors. 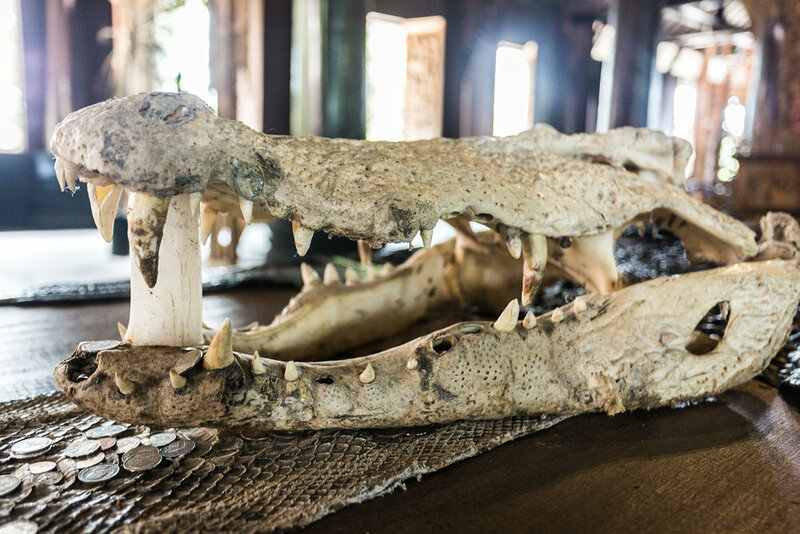 Long dining room tables covered by the skins of snakes equally as large, crocodile skulls, chairs made from animal parts, phallic carvings, and skins hanging from the ceiling, are among some of the objects of which bewildered visitors must contend. The doors on the opposite end of the building open up to the rest of the campus, primarily comprising several dozen structures, also stained-back and redolent of the Lanna style. Other buildings in the complex take on varying forms such as the breast-shaped chambers and the apartment that looks like a slug. Only a handful of the buildings are open to the public, but one can observe, by peering through the windows, that all are chock full of the same sort of brow-raising artifacts found in the main hall, truly a matrix of the absurd—an occult counterpoint to the angelic hues of Wat Rong Khun. Inside the Baan Dum's centerpiece edifice. 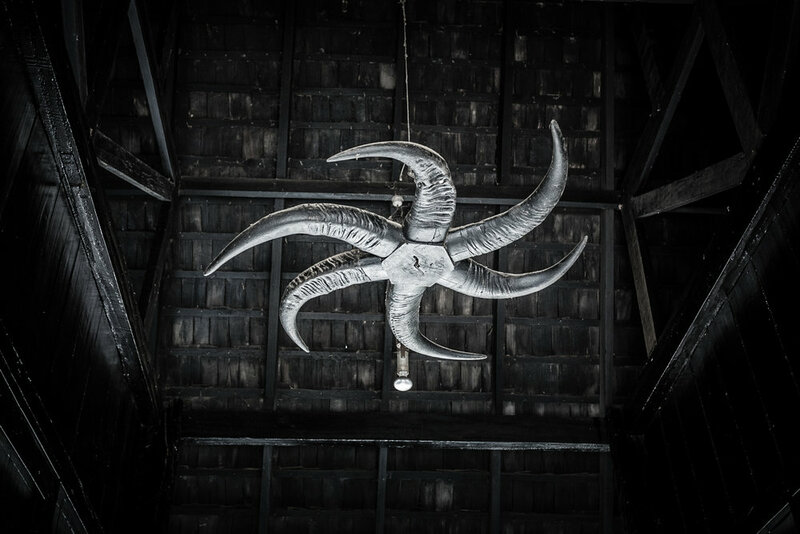 A twisted animal skin hanging from the ceiling. A 15-foot snakeskin with "good luck" money left by guests. One of my favorite works, the slug house! 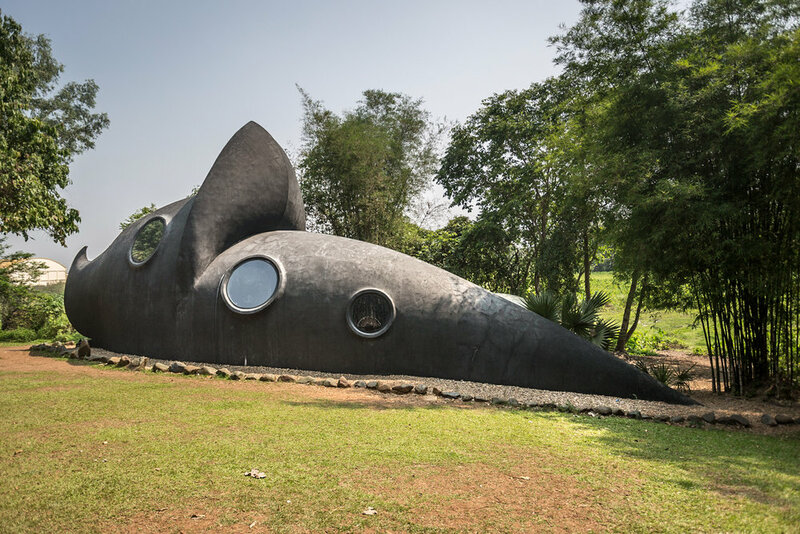 Breast-shaped building covered with eyes. Inside one of the breast-shaped buildings.